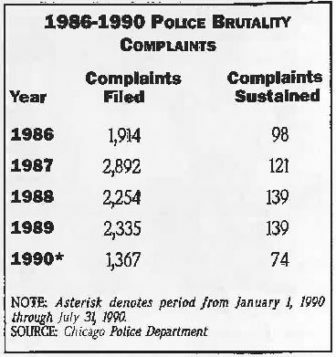 The agency that investigates allegations of police brutality received 1,367 such complaints during the first seven months of 1990, slightly less than the 1,420 complaints it received for the same period in 1989. And though it received fewer complaints, the Office of Professional Standards (OPS) has sustained, or upheld 74 complaints this year, about the same (75) as in 1989. The Chicago Reporter analyzed police data one year after widespread charges of police brutality swept the city. The Reporter reviewed data on OPS complaints for the years 1986 through 1989 and for January 1 through July 31, 1990, the most recent data available. Among the four complete years studied, 1987 had the most complaints. Those cases upheld by OPS were referred to police officials for disciplinary action. OPS, which was created in 1975, has a staff of 65 civilians who investigate brutality complaints against police officers and make disciplinary recommendations to the police superintendent, who can either accept or reject the recommendations. Ultimately, any disciplinary action must be approved by the nine-member police board. The OPS director is appointed by the mayor and reports directly to the police superintendent. Though neither the police department nor OPS could provide a complete accounting of all disciplinary actions, OPS says that most of the cases they sustain result in suspensions or firings. Data were available for actions taken by the police board, which reviews the most serious cases. The board fired three police officers and suspended 17 others between Jan. 1 and July 31, while only two officers were fired and 14 suspended in all of 1989. Some community leaders who criticized police during last year’s controversy said the increased disciplinary activity reflects some positive reforms at OPS, but they add that the number of complaints does not reflect what happens on the street. “The bad thing is that little of [the reforms] has trickled down to the street cops yet. I still get four or five people a week coming into my West Side office to tell me how they’ve been assaulted by police,” said Nancy Jefferson, a West Side community activist and police board member. OPS came under fire last September after several highly publicized incidents of police brutality. Scores of citizens testified about incidents of brutality at public hearings. Community leaders complained that OPS was doing an inadequate job of investigating complaints, that investigations took too long to complete, and that OPS and the police department are too closely tied to ensure fair investigations. Police Board Chairman Albert C. Maule said OPS has speeded up its investigations. For the first seven months of 1989, a total of 1,283 investigations had been completed by OPS. So far this year, 1,416 investigations have been completed. Both Maule and Police Supt. LeRoy Martin say they are initiating reforms of OPS and the 13,000 member police force. Martin, for example, says he takes a second look at every case that OPS fails to sustain to be certain the case has no merit. And police board meetings have been shifted from police headquarters to various neighborhoods and scheduled in the evenings so that more citizens can attend. Maule, an attorney, was appointed last fall along with five other board members by Mayor Richard M. Daley as part of an OPS-related shakeup. OPS Director Gayle Shines, who was appointed by Daley last May, served as Daley’s deputy when he was the Cook County State’s Attorney. She declined to be interviewed by the Reporter, saying she needs to become more familiar with her new job. Recently the number of brutality complaints filed with OPS has ranged from 1,914 in 1986 to 2,335 in 1989. While some police critics have charged that police attacks on African Americans are on the rise, there is no way to determine that because OPS does not keep data by race. But Maule said that one of the firings this year included a black, off-duty patrolman who allegedly shot an unarmed black on the West Side following a traffic dispute. In another case, a white officer was dismissed after he was charged with savagely beating a Pakistani cab driver on North Michigan Avenue. The victim was handcuffed during the attack. Glenn Minnis is a Chicago freelance writer who has covered police matters. In 2000, The Chicago Reporter investigated a string of questionable murder convictions tied to Chicago police Detective Reynaldo Guevara. In March 1999, Chicagoans were pressing for police reforms based on a record-number of police shootings of civilians in the previous year, according to a story from the archives of The Chicago Reporter.